John steals money and a bracelet/temporal dislocator from a Chinese antiques shop. 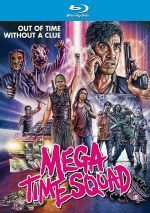 A new entry in the time travel genre, 2018�s Mega Time Squad takes us to New Zealand. John (Anton Tennet) functions as a minor criminal but he dreams of something bigger. To facilitate this, John rips off boss Shelton (Jonny Brugh) and makes off with stolen goods that include a Chinese amulet. It turns out that this item allows its possessor to travel through time � well, back a brief period, at least. The magic comes with a side effect: it creates a duplicate of its user. John uses this to form a team of Johns, a decision that comes with unforeseen repercussions. Like many time travel movies, Squad comes with a clever concept. Unlike most, though, the movement through time doesn�t play the most important role. Oh, that element definitely acts as a substantial aspect of the tale. However, the twist that allows for the creation of multiple Johns � and those aforementioned unforeseen repercussions � become more important. While those form the movie�s most creative component, they also turn into something of a problem, too. As the movie progresses, it gets messier and messier. This means the movie threatens to collapse under its many complications and pretenses. At times, Squad feels more like a series of logistical discussions than a lively adventure. Because it becomes so mired in the muck, Squad sputters in the third act. We just find too many plot issues and too little fun and cleverness. Still, Squad manages to deliver a clever romp for a while, and even when it loses its way, it never becomes bad. The third act might fizzle but it still keeps our interest to a degree. Nonetheless, the best parts of the film come in the first 50 minutes or so. Nothing here ever feels tight or especially well-developed, but it doesn�t really matter, as the gonzo energy of the wacky narrative carries the day. The actor flesh out their roles pretty well, too. All play their parts for laughs, but they exhibit deadpan humor and don�t overdo their performances. Ultimately, Squad can�t turn into anything great, but it still musters entertainment value. Though messy at times, it becomes reasonably enjoyable in spite of itself. Mega Time Squad appears in an aspect ratio of approximately 2.35:1 on this Blu-ray Disc. I thought the Blu-ray provided consistently satisfying visuals. Sharpness was generally positive. A smidgen of softness appeared in some interiors, but those instances were minor. Instead, the program demonstrated nice clarity and accuracy the vast majority of the time. Colors stayed fairly subdued for the most part. The settings didn�t favor a dynamic palette, but the hues looked reasonably accurate and full, with a not-unexpected emphasis on teal, amber and orange. As for the DTS-HD MA 5.1 audio of Squad, it worked pretty well. Not as much of an action extravaganza as one might expect, the soundscape doesn�t offer a whole lot of note. A few scenes � like time travel and a few violent bits � opened up the mix in a moderate way. 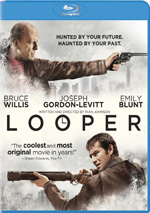 However, this was a chatty/comedic movie overall, though, so one shouldn�t expect much from the soundfield. Audio quality always appeared positive. Music showed warm, full tones, and effects � as low-key as they were � sounded accurate and concise. A few extras appear here, and we find an audio commentary from writer/director Tim Van Dammen. He offers a running, screen-specific look at the project�s roots and path to the screen, story and characters, music, editing, photography, cast and performances, sets and locations, and related topics. We get a fairly good discussion of the film, as Van Dammen touches on a nice array of subjects and an informative manner. He loses some steam as the track goes, but this still becomes a useful chat. 11 Deleted Scenes fill a total of 14 minutes, 12 seconds. Easily the longest comes from an �Alternate Opening�, as it runs four minutes, two seconds. It�s not all that �alternate�, though, as it largely just moves the folklore about the amulet to the start of the movie instead of the middle. The remaining scenes feel uninspiring. Many just slightly extend existing sequences, and the new shots pad out characters in a minor way. Nothing noteworthy appears here. The disc opens with ads for Black As Sin, The Dark, Level 16 and White Chamber. We also locate a trailer for Squad. Blessed with a clever plot, Mega Time Squad only sporadically lives up to its potential. Nonetheless, it does enough right to become a mostly fun action-adventure. The Blu-ray brings good picture and audio along with a few good supplements. Squad ends up as a minor pleasure.